I travel extensively, and while I have numerous power bricks and cables for my home office, I needed something that would be light and portable for the road, able to charge multiple devices, and support QuickCharge for the devices I carry that support it. My search lead me to the AUKEY USB Charger, formally known as the AUKEY 42W 3-Port USB Desktop Charging Station, found here on Amazon for $25.99. 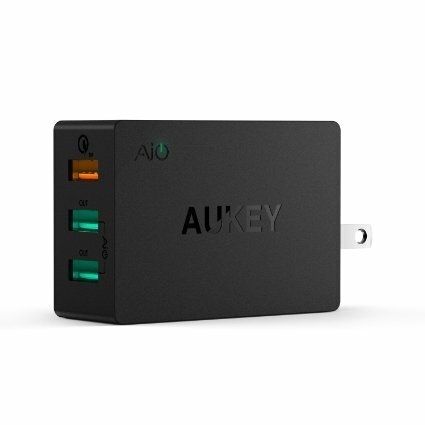 The AUKEY USB Charger is compact and relatively lightweight, but with enough heft to make it clear you’re getting something with the ability to properly charge multiple devices simultaneously. At 7*4.8*2.6cm / 2.76*1.89*1.02in (L*W*H) it’s not particularly large, and at 106g/3.7oz it’s not going to weigh down your kit, especially considering how many power bricks it can replace. The power prongs fold into the body of the device, keeping it nice and compact during travel. I’ve paired this adapter with a short MicroUSB cable and a short USB-C cable for charging my Lumia 950XL and other devices and it makes for a nice compact kit for all my charging needs. This adapter certain can handle plenty of power draw, especially when using the Qualcomm QuickCharge 3.0 port. I’ve tested it with a RAVPower 20100mAh Power Bank and found that it can bring the unit to a full charge from fully depleted a full third faster than a 3A USB-C charger, and it would certainly be even faster than a standard 2.4A MicroUSB charger. In real-world use that is a full charge in 5 hours instead of 7.5 hours. While I don’t have a QuickCharge 3 end device to test with, I’d have to say the results I’ve seen with be similar with QC3.0 smartphones. The AUKEY USB Charger works well when charging multiple devices, and I didn’t see any impact on charge times when charging multiple devices. The AUKEY USB Charger is not only a decent price for what it provides, but is good value for the money. It provides a nice portable and lightweight charging solution for the frequent traveler who carries multiple devices, and also has the internals to carry multiple devices at home.